Judie's article began with the plane landing on that warm July night in 1960. I remember that night very well too, but I also remember the decisions that led up to it, since moving to Hawaii had been my idea in the first place. Judie and I worked at "the bank." Lots of high school grads did in those days. We'd both been hired right out of high school. We worked in the messenger department during our first year with the bank, a training ground for twenty "lucky" young women. The bank was the head office of US National Bank of Oregon, in Portland, a beautiful old building of white marble and shiny brass, mahogany wood paneling and oriental carpets. We sort of had the run of the place, flitting from one department to the next, on beck-and-call for anybody who needed a messenger to run errands either inside or outside the bank. Most of the staff called it the "fun department" and it was. But after our year of having loads of fun and learning a little about banking, we were transferred to real jobs. Judie and I both landed in the trust department. I was in "disbursements." Every morning there would be a stack of bills on my desk. I'd check to see if the client had enough money to cover the bill and then I'd write a check to pay it. I paid bills for rent, utilities, mortgage payments, incidentals, allowances, vacations, attorneys fees, whatever came across my desk. I finally realized that some people in the world had enough money to hire a bank to do the chore that the rest of us struggled with at home after we got done with work. It was boring and tedious work and it never ended, no matter how fast I learned to type checks. There were several other "girls" in disbursements and we all did the same thing. There must have been plenty of rich people in Portland. I wasn't rich, by any stretch of the imagination. I lived with another bank employee. We shared an apartment and barely made ends meet, but we were proud of the fact that we were living independently of family. And our parents seemed proud of us too, but reading between the lines, we knew that they were just a little uneasy about our situation. It was understood in those days that we should be looking for husbands, and our families would rest easier once we were married and could put those working days behind us. But we weren't quite ready for that yet, probably because none of us had met a suitable mate, and the prospects didn't look too good. We whined the usual complaints. There was no place to meet interesting men. We were twenty years old, too young to go to bars, and too old to do the things we did when we were in high school. We never seriously considered the notion of going to college, or "night school" as we called it. That certainly didn't appeal to us. I knew that I was tired after eight hours of pounding a typewriter every day spending some rich person's money. Like Judie, I grew up in Portland. It rains a lot there, and sometimes it snows in winter. It's depressing, especially when you have to commute to work by bus and walk through the rain and mud and snow in high heeled pumps, which we always wore to work in those days. It's endlessly depressing, especially since the Portland summer lasts about three weeks and you cannot count on which three weeks it will be. Weather was definitely a factor in our decision to go to Hawaii. I'd been there the year before on a short vacation. I had been so taken with the tropical weather and the beauty of the place that I simply couldn't stop talking about it. So whenever our conversations turned to our depressing situation, I always brought up Hawaii and its beauty. We finally decided that we needed a change. We would either move to San Francisco or Hawaii. California was the usual dream spot for us. Sometimes when we were truly bored on Friday nights, we'd pile into our car and head south with the idea of crossing the border into California, just to say we'd been there. We'd usually get as far as Eugene and then turn back, but the notion of breaking away from Portland was a constant undercurrent of our conversations during those years. We decided on Hawaii. It was a thrilling decision. Some of our friends had moved to Washington DC to work, and we thought that that was fairly brave. A few of our high school crowd had gone off to college. But nobody went to Hawaii -- to live. It would be a grand adventure, but a costly one. We needed enough money for a one-way airplane ticket and expenses until we could find work. None of us had a savings account. I sold my car for airfare. We gave up our apartment and moved home for a couple of months to save up. Our families were skeptical but nobody tried to talk us out of it. We had been on our own for a couple of years now and I guess they figured we could take care of ourselves. They were right. We were nervous but we figured we could make it. And the big day finally came and the three of us boarded the plane with our one-way tickets, several very heavy bags and our dreams in hand. In her memoir Judie said her secret prediction was that there would be no romance in her life. I don't remember if I made any predictions for myself. I don't think I would have ruled out romance. I do remember Albert, our taxi driver, whom I thought of more as an opportunist than the true spirit of aloha. We were an interesting change of pace for him from the usual tourists he picked up at the airport. He wanted to "get lucky" with one of us and we were coy and misleading toward him. We flirted a little, and he kept chauffeuring us around during our first days in Hawaii, free of charge, his only requirement being that one of us had to sit in the front seat with him. We took turns. 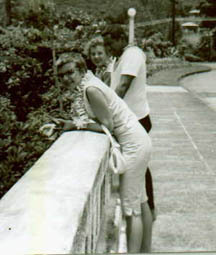 The highlight of our tour of Oahu, on that fateful day that Judie met Dondi, was the visit to Waimea Bay. However, as I remember it, Judie spotted Dondi from the road, where we had stopped and gotten out of Albert's taxi to admire the view. The view she spotted was the "bronze god" on the big rock that sits at the edge of the water. Albert claimed to know the guy, which impressed us, so he offered to take us down to the beach to meet his friend. We spent the rest of the afternoon with Albert's friends and Judie and Dondi hit it off at once. The rest is history, as they say. Three months later, Judie and Dondi were married and shortly after that, Judie was pregnant. I had a nice day at the beach and an invitation to their wedding. Those first days in Hawaii were eye-openers for the three of us. We all eventually found office work. We moved into an apartment. Money was very tight. Everything cost more than we had expected it would, even though we were making the same money that we did back home. The office work was the same. When Judie got married, I had to move out of our little Makiki apartment. Dondi would move in with Judie. That was fine. I answered a "room-mates wanted" ad and found another place to live. Things became more fun. 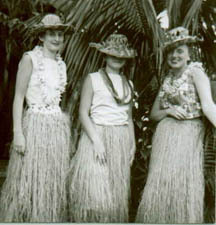 I moved in with some mainland girls who were going to the University of Hawaii. We started meeting people, having parties, going to the beach and out to dinner. We were thrilled with the pleasant turn of events. Although we envied the fact that Judie had found the love of her life, neither of us envied her current circumstances. And as time went on, we had less and less contact with her. I was working for Cook Trust Company in the property management department. Once again I was handling rich people's money. Fortunately, I was no longer simply paying their bills. It was interesting work, managing rentals and watching rich people income growing. At that time, everybody was reading Michner's Hawaii. I read it too and as a result I learned something of island history. It was then I came to realize that I was working for the descendants of the same missionary families who still continued to control the land that had been taken from the native people of Hawaii. Our clients were the Dillinghams, the Doles, and the Bishop Estate, among others. I cringed as I read the awful chain of events that led to Hawaiian statehood, and the more I read, the more I came to understand the tension between all the various island factions. In the meantime, our social life, while fun and frenzied at times, never resulted in any meaningful relationships for me. I met lots of guys, mostly servicemen. We all knew what they wanted. None wanted a serious relationship, and I wasn't available for the price of a dinner and a few drinks, although I had lots of offers. I stayed away from the local boys, after one disastrous short-lived relationship. I met a good-looking hapa-haole, car salesman. He courted me fairly seriously but things just didn't work out. He thought I wouldn't go to bed with him because he was only half-white. I had news for him, I just didn't like him well enough. I avoided the local boys from then on. By the end of the first year, the college girls were moving back home and the party was definitely over. I moved closer to Waikiki figuring that since I couldn't afford a car, it would be nice to be close enough to the beach to walk over after work and on weekends. That turned out to be a good idea. I set up housekeeping and got into a comfortable routine, but soon realized that I was essentially in the same rut that we had left in Portland. There was no great future in the work I was doing, a dead-end office job, with no hope of making enough money to live very high off the kalua pig, as they say. It was time to review the options. I couldn't figure out any reason to stay on in Hawaii. No good job, no man in my life, no room-mate, and only a slim possibility that I'd be able to make it financially on my own. It was time to leave. Although I loved the islands for their beauty, I was an outsider. I felt it at work and in my personal relationships. Local people were hesitant to become friends with me and I wasn't interested in fleeting relationships when the fleet came in. So after two very interesting years, I moved back to the mainland, leaving Judie behind. I was going to head for California. It had been a grand adventure. Judie and I were trying to decide where to move somewhere. We had ruled out California in favor of Hawaii. Now I could cross off Hawaii. It was California's turn. I was once again excited about my future. This time I would go alone, all I'd need was a one-way plane ticket back to the mainland and then, California, here I come. � No portion of Clever Magazine may be copied or reprinted without express consent of the editor.